A deeply melancholic book about human nature in the tradition of P.O. Enquist and Sara Stridberg. Olof Ågren and Lotte Laserstein: A farmer’s son from Jämtland and a Jewish woman who fled from East Prussia. Both painters, both settled in Småland – and both passed into oblivion. 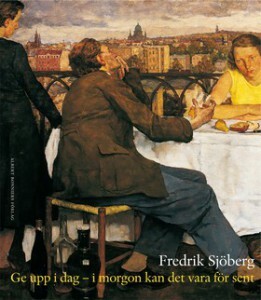 Fredrik Sjöberg dedicates this book to their lives and works and takes them as a starting point for a broader philosophical reflection about his own life and pursuit: When do we stop in our quest for recognition, for success? And: why is experiencing loneliness a privilege to some and a punishment to others? Ge upp idag deals with the dilemma of fleeing, of female capability and male artist’s mysticism, but also with the difficult art of knowing the right time to make the break. Olof Ågren gave up painting in the ‘30s of last century, when he thought he was at the top and predicted to be one of the great artists with a brilliant career. Lotte Laserstein, on the other hand, has been drawing for her whole life, with varying success. The book is illustrated with the most important works of the two painters – a treasure that was long hidden from the world. The author: Would certainly describe himself as a solitary person. Fredrik Sjöberg is one of the friendliest wolves in sheep’s clothing, a biologist, an honorary professor at two universities, author of a now long series of books, which he dedicated to the theme of passion in many diferent ways. His books have been translated into 11 languages.